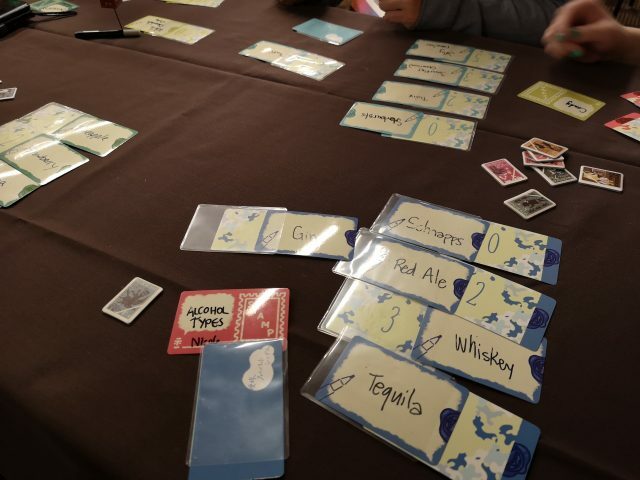 November has rolled around, and gamers from all over (but primarily Texas) gathered in the Hyatt Regency DFW Airport for the last time for BGGcon Prime, as it’ll be moving to its new location downtown next year. 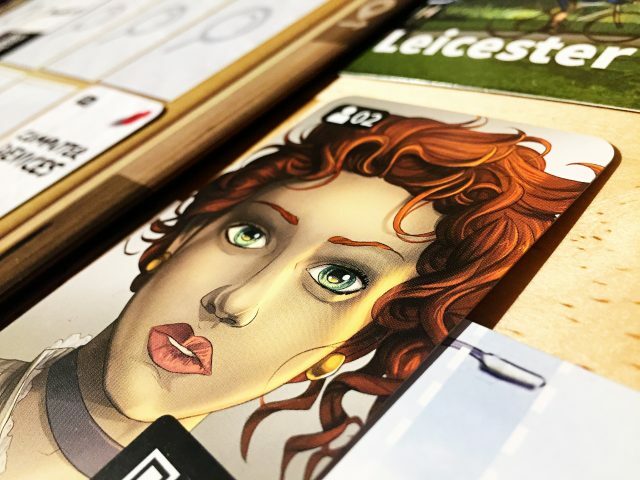 There was hustle and bustle as people got their game on – whether at the hot games tables full of Essen goodies or hyped up titles, or from the massive library (seriously, these are just the new game shelves). 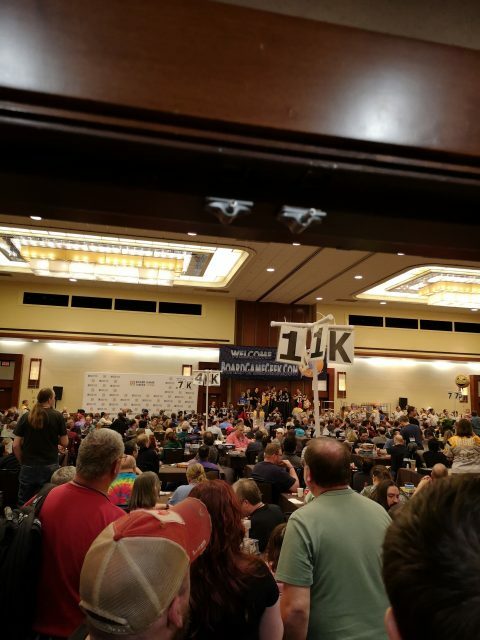 BGGcon is a playing con, more than most I attend, and it’s a wonderful experience. So what did I play that stood out, from almost 40 unique titles? Friends and I beelined it to the hot games tables after registration to play through Treasure Island, new from Matagot. This is a one-versus-many game – with the small difference that the many are also against each other! Players are racing to find Long John Silver’s treasure before each other, and before he can escape jail and retrieve it himself. The production quality on this is amazing (lots of cool components, even if the drawing tool is slightly fiddly), the art from Vincent Dutrait is a wonder, and I had a lot of fun. Enjoyed the variable player powers, too! Because I haven’t gone wrong with sitting down to a Wolfgang Warsch game so far, I made sure to get a game of Fuji in. 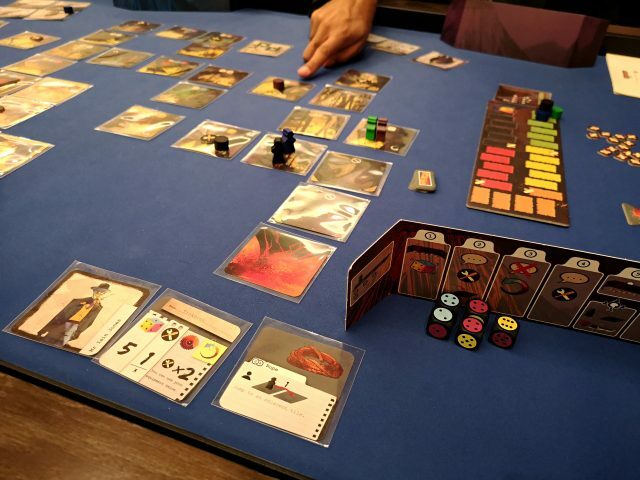 This is a devilishly difficult co-operative game where players are trying to make their way out of the path of lava flow and into the safety of the village. The catch is, you’ll be rolling dice in secret (with minimal communication) and trying to hit the goal of your destination and hope that players either side of you don’t happen to do better or you’ll get stuck. 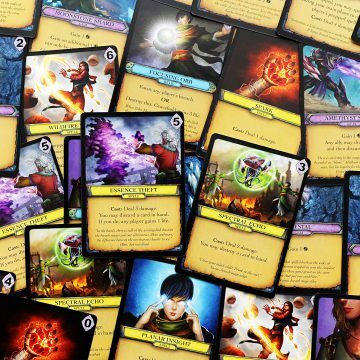 This is a hugely interesting addition to a co-operative game, and makes a lot of sense when you consider his card game about guessing and hoping for the best – The Mind. I was lucky to have my copy of Teotihuacan with me (review soon!) and taught it to friends. Rather than the starter game I’d done a couple of times, I set up the randomized one and it was fantastic for us all. 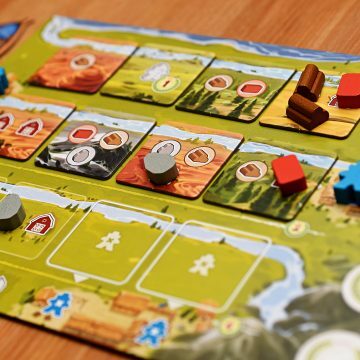 It’s a great worker placement/dice manipulation game with a lot of different paths to points and victory over 2 – 3 phases of a game with very little to score game-end. This is a solid one after multiple replays. My last day of the con I grabbed a seat at Carpe Diem, the new Stefan Feld. I went in knowing very little and came out loving it! A similar weight to my fave, Castles of Burgundy, this is a tile drafting/tile laying game with a tight race for points – it was nice and puzzly, too. Definitely interested in picking this up once Ravensburger get it on shelves in North America! 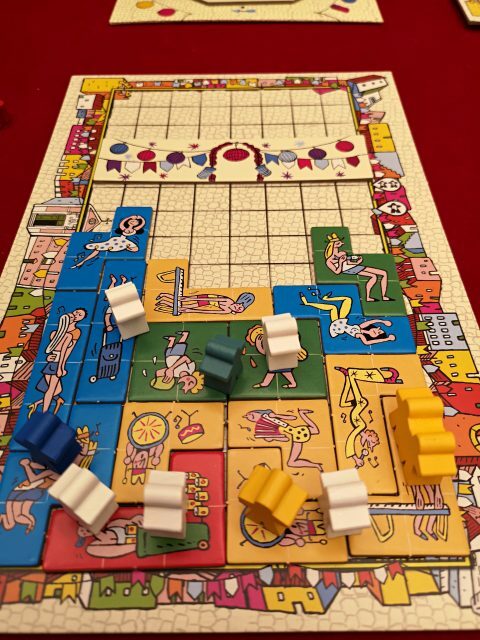 As you may have guessed from last week’s review of Gingerbread House and my mention of Carpe Diem above, I love a good tile laying game. I tried a whole bunch of new ones in addition to Carpe Diem,too! Arraial is a fun tetris-like game where you’re grouping together like types of party-goers in your grid, trying to not have your banner slide down and lose you points (super glad this one’s coming to NA from Pandasaurus Games!). I’d seen some buzz about Majolica on Twitter, as it looks simply gorgeous. It’s a sort of strategic tile-taking/pattern building game with a couple of twists, which I thought was quite clever – but the game overstayed its welcome even at 3 players. I’d be interested in a 2p game of it! Late in the con I grabbed Scarabya, from Blue Orange Games. Players will be grabbing pieces designated by a card flip (Karuba-style) and setting them out on your map in order to close in parts of your “dig site” to capture scarab amulets. The number of amulets in the enclosed space is multiplied by the number of squares (up to a max. of 4) and there’s your points. Heavy on the puzzle side, this one! It was really neat, especially with the little 3D rock mounds placed on your map to work around. I love a light and silly game, especially to punctuate longer plays at an event like BGGcon. I got to try some really fun stuff this time, from dexterity games to novelty marble games and all things in between. 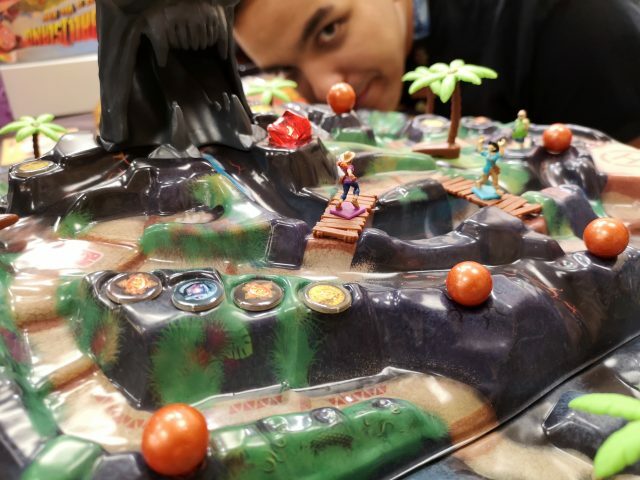 Actually, the last game of the con for me stuck with me a little – Planet from Blue Orange. It’s … sort of a tile-playing game? But there’s the novelty of it being three-dimensional. It’s a little like taking Kingdomino and wrapping it around a dodecahedron – making sure you’re plotting out some of the terrain placement in order to score your private goal, but also entice certain animals to your planet. A somewhat more trepidatious venture was giving Men at Work, the new dexterity game from Pretzel Games, a try. The game itself is a super neat challenge of placing certain items in certain places, which offers some really nice table presence as a mess of workers and beams. It was fun, if a little samey; and let’s just say that shaky hands mean some workplace incidents..
I’m always up for giving a new roll & write a whirl, so was happy I got a few in. I’ve played Let’s Make a Bus Route before, but it was cool to see it in the new games section of BGG’s library. I really hope that, like some of Sashi & Sashi’s other games, this one gets North American distribution. I’d been eyeing up Criss Cross after hearing of it through folks, and it was a good one to try. It’d dead simple, but it’s a nice (sometimes brainy) little puzzle and it’s nice to have a roll & write with symbols rather than numbers. 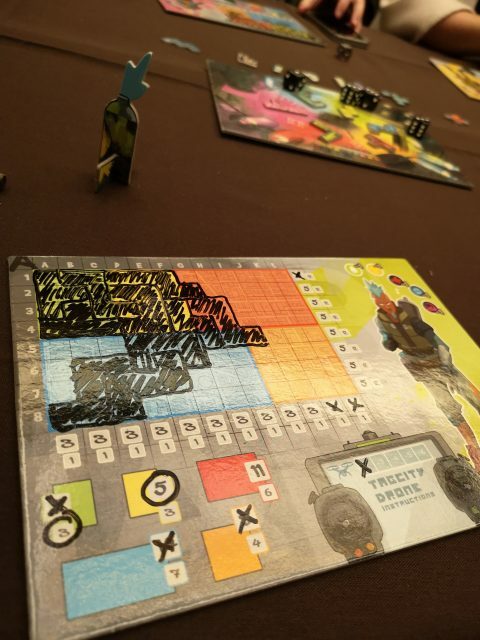 Before getting in a couple of games of a fave, Railroad Ink with pals, I got to try Tag City. This had flown entirely under my radar, so I’m really glad I had a chance to grab it from the library to try! It’s a really satisfying little polyomino puzzle that feels a bit like Tetris and Noch Mal made something prettier. Just One was something my friend Ace described to me and I bought without even having played it – and I don’t regret it one bit! A designated guesser will have a card of 5 words facing out from them, and randomly select a number 1-5. The other players will secretly write a one-word clue and then compare with each other – any duplicates are removed (just one, remember!) and those clues are then shown to the guesser in hopes it’ll lead them to get that word. It’s so hilarious to see where people go with their clues to try and be unique enough to not duplicate things, but still clear enough to help someone guess. I can highly recommend this one, it got played tonnes around the con. That was weird and dang, it was fun. I’ve enjoyed some mystery solving games before, but Chronicles of Crime was a really cool new way to play a game like this, even if it was weird having a game that is run primarily by an app. 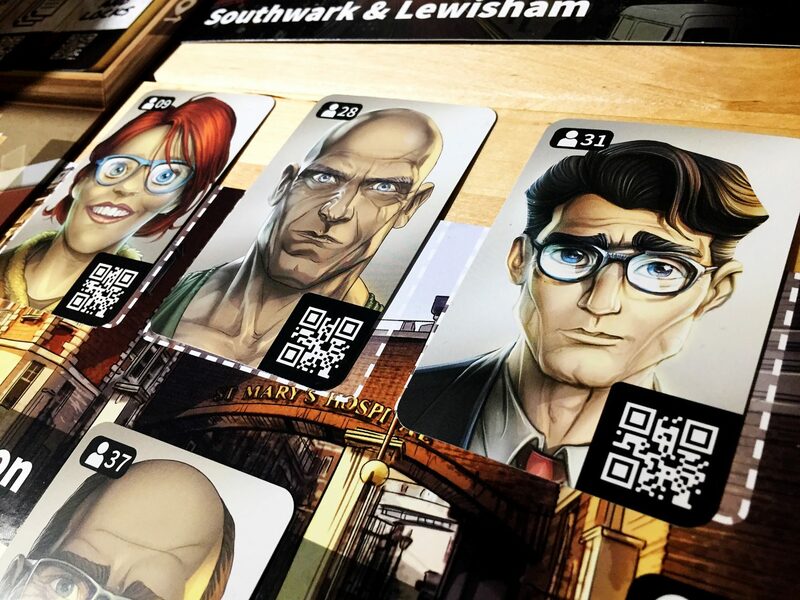 However, it does have a spatial aspect – as you visit locations and meet people, they’re laid out around a central board where you’re collecting evidence cards – like one of those elaborate crime boards with pins and string everywhere, almost. You can use the app to question folks about evidence, other people and suspects – plus call in experts like a forensic scientist to help you with your investigation.I was SUPER suspicious going in, but ended up loving it so much I bought a copy to bring home. 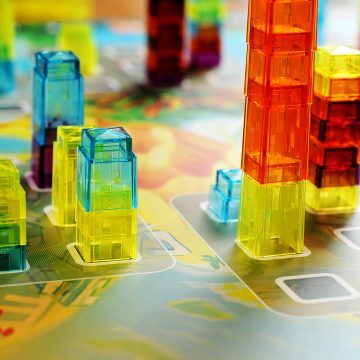 This is really a great, streamlined mystery game – Lucky Duck Games have gold here! When I saw a friend’s photo of Strange Vending Machine it was on my mind constantly to try – and they grabbed it from the new games section so we could! 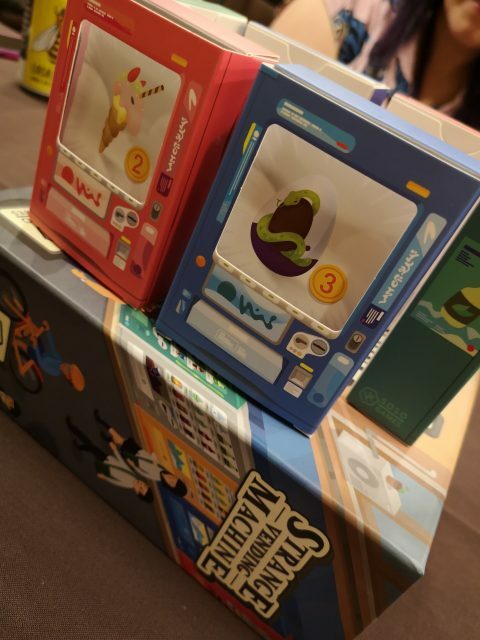 This is a cute little set collecting game with some bluffing all wrapped up in a fun 3D package of components – with a couple of modes to play, we chose “Ingredients and Recipes of the Mysterious Wizard”. Players start with coin tokens (some of which might be fakes) and will take a turn that’s either paying a required amount into the coin slot of the machine they want to buy from (possibly paying with fakes! ), or grabbing a machine and secretly taking all of the money from it – hopefully it won’t be filled with counterfeit! The “strange” part of this comes from the items in the machines – things like bat wing chips and unicorn ice cream; hopefully you’ll grab all the right stuff to score, because while you know the item you’re buying, the conditions on the card are hidden in the machine until you buy the item. I took great delight in feeding these machines with money and buying all sorts of weird stuff to gain points, and it’s a really great little light game with fabulous table presence. If you were to play a trick-taking game without knowing what numbered card you were playing, how would you go? Eye My Favorite Things is one of the oddest and intriguing games I’ve played in a while. 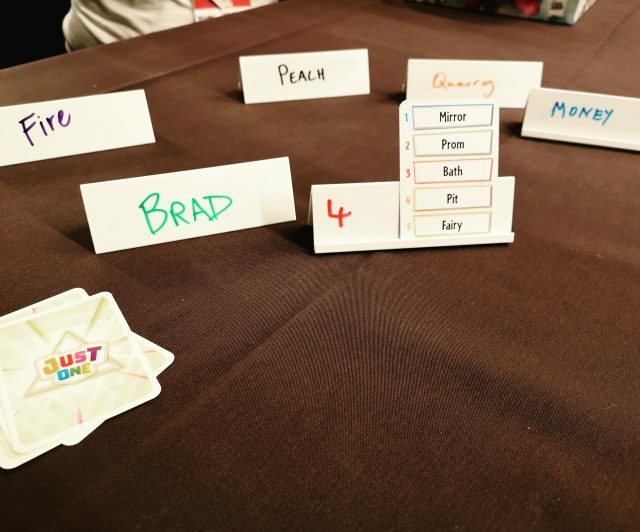 Players are given a category from the player next to them – say, fave types of hats – and then write out 5 things ranked that they like and slide those into a sleeve hiding the rank number. They will also write out one thing of that category they hate, and that will go into the “0” card. Then you hand them back to the person who assigned your category, and they’ll use them as their hand in the trick taking round. It’s essentially a big mind game after that of trying to figure out if a beer hat would be ranked better than a fedora, or if you know what is the hated item so you can hopefully play that out if someone plays a top-ranked card, because you’ll trump them! It’s fascinating and mind-bending and I kinda loved the heck out of it. Glad for the BGG library to get to try weird stuff like this. Towards the end of the con I was cramming in games. Sometimes to my detriment, as I did pretty poorly! There’s a couple of titles that piqued my interest that I want to revisit and replay as I think they’re both worthy of that. First up is upcoming from Renegade Games, Passing Through Petra, which I’d been curious about as I’ve enjoyed a lot of J. Alex Kevern’s games to date. This has an unusual mix of action selection and set collection, which then drives the movement of player pieces around 5 tracks, allowing players to get markers from their personal boards out onto those tracks. It’s a race to be the first to get them all out, and although there’s a lot going on to do that, it’s a really cool way of getting there. Collecting sets of merchants and buyers that will multiply your movement around the tracks is fun to optimize, and I want to see how I go on another play around trying to focus on this. I’d heard a little about Smartphone Inc out of Essen, but really wasn’t sure what the game was all about. Friends had played it earlier in the con and were recommending it, so I joined a 5 player game to give it a whirl. 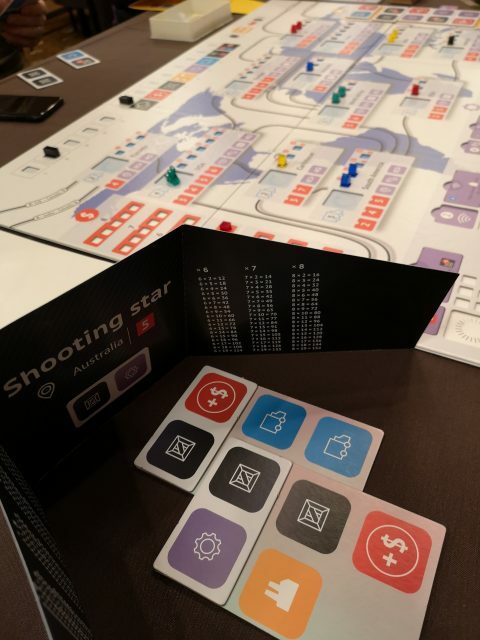 A mix of action selection/engine building/area control leads players to try and dominate a world map with their smartphone products and make the most money. The action selection part was really cool and unique – players use “tablets”, which are boards showing certain actions. You’ll arrange these in a way that gives you a certain set of actions which can differ each round – be it researching special technologies, producing items, or having your logistics team branch out over the globe. I loved the interplay of all of this and now I understand how to approach it, I really want to play again with some different tactics. So another BGGcon ends – my brain full of games and friends and great times. It’s always a fantastic way to wrap up the year of cons for me, and I’m looking forward to settling in to play and replay some of these over the next couple of months and into the chilly new year.